"11 Then He said: “A certain man had two sons. 12 And the younger of them said to his father, ‘Father, give me the portion of goods that falls to me.’ So he divided to them his livelihood. 13 And not many days after, the younger son gathered all together, journeyed to a far country, and there wasted his possessions with prodigal living. 14 But when he had spent all, there arose a severe famine in that land, and he began to be in want. 15 Then he went and joined himself to a citizen of that country, and he sent him into his fields to feed swine. 16 And he would gladly have filled his stomach with the pods that the swine ate, and no one gave him anything. 17 “But when he came to himself, he said, ‘How many of my father’s hired servants have bread enough and to spare, and I perish with hunger! 18 I will arise and go to my father, and will say to him, “Father, I have sinned against heaven and before you, 19 and I am no longer worthy to be called your son. Make me like one of your hired servants.”’ 20 “And he arose and came to his father. But when he was still a great way off, his father saw him and had compassion, and ran and fell on his neck and kissed him. 21 And the son said to him, ‘Father, I have sinned against heaven and in your sight, and am no longer worthy to be called your son.’ 22 “But the father said to his servants, ‘Bring out the best robe and put it on him, and put a ring on his hand and sandals on his feet. 23 And bring the fatted calf here and kill it, and let us eat and be merry; 24 for this my son was dead and is alive again; he was lost and is found.’ And they began to be merry. 25 “Now his older son was in the field. And as he came and drew near to the house, he heard music and dancing. 26 So he called one of the servants and asked what these things meant. 27 And he said to him, ‘Your brother has come, and because he has received him safe and sound, your father has killed the fatted calf.’ 28 “But he was angry and would not go in. Therefore his father came out and pleaded with him. 29 So he answered and said to his father, ‘Lo, these many years I have been serving you; I never transgressed your commandment at any time; and yet you never gave me a young goat, that I might make merry with my friends. 30 But as soon as this son of yours came, who has devoured your livelihood with harlots, you killed the fatted calf for him.’ 31 “And he said to him, ‘Son, you are always with me, and all that I have is yours. 32 It was right that we should make merry and be glad, for your brother was dead and is alive again, and was lost and is found.’”" (Luke 15:11-32, NKJV). This parable is often expressed by people in Christendom with a negative connotation such as "the lost Son, the prodigal Son, etc..." but never is seen as the "the ever merciful Father, the benevolent ever forgiving Father, etc....". The one reason I believe that they are scared to emphasize the goodness of our Father God is because of the fear that the believer who hears it might start to live a licentious life and then a human negative mindset that always tends to see a small black dot in a big white sheet makes people to see the bad nature of the younger son to condemn it, rather than appreciate that the younger son who did not fail to remember the unfailing merciful nature of the Father some how or the other. According to Apostle Paul who wrote one third of the New Testament by the inspiration of the Holy Spirit said clearly, "...the goodness of God leads [us] to repentance." (Rom 2:4,c). This shows that the more we begin to experience the goodness of God's forgiveness day after day and year after year, the more we will begin to repent for the bad attitude and sinfulness that keeps us away from the love of the Father God (1 John 2:15-17). Also Jeremiah the great prophet in the midst of a sorrowful lamentation for the wrath of God by which He sent them in to exile for seventy years, in to the cruel yoke of the Babylonians that befell on the whole nation of Israel for their unrepentatant attitude towards God said, " 21 This I recall to my mind, therefore I have hope. 22 Through the LORD’s mercies we are not consumed, because His compassions fail not. 23 They are new every morning; Great is Your faithfulness. 24 “ The LORD is my portion,” says my soul, “ Therefore I hope in Him!” 25 The LORD is good to those who wait for Him, to the soul who seeks Him." (Lam 3:21-25). In the midst of hopeless situation the great prophet Jeremiah here remembers the mercies and grace of God and as a result has his hope soaring about God coming to rescue him and his beloved nation from the rightful wrath of harship and sinfulness that is consuming them. This teaches us that understanding the ever forgiving nature of God and seeking him for it all the time especially whenever we fall in to sin can only keep us away from sin and its bondages more and more progressively in our life. This is true repentance. This is why the awesome man after God's own heart did not try to deliver himself from sin's clutches but appealed to God's mercies to deliver him by saying, "11 Do not withhold Your tender mercies from me, O LORD; Let Your lovingkindness and Your truth continually preserve me. 12 For innumerable evils have surrounded me; My iniquities have overtaken me, so that I am not able to look up; They are more than the hairs of my head; Therefore my heart fails me. 13 Be pleased, O LORD, to deliver me; O LORD, make haste to help me!" (Psa 40:11-13). God responded whenever David appealed to God's merciful nature to rescue him from sin and evil. God loves to show His mercy again and again, day after day, year after year in an unending way to all His children (Micah 7:18-20). Only this love of the Father makes us special recepient of God's spiritual inheritance and saves us for eternity (Gal 3:26). The very fact that our Father God forgives us time after time, whenever we come to him in our unworthy sinful state for forgiveness is based on the ever forgiving nature of our Father in Heaven. In other words, the fear of God increases in us the more we experience the ever forgiving nature of God the Father progressively more and more (Psa 130:4). The more I experience God, the more I feel that I am the prodigal son who is given a party of God's mercy and grace time after time. The more I experience the goodness of God, the more I come to understand and remember how sinful I was and how merciful my Father God in heaven is. You know the Scripture says, " 6 For when we were still without strength, in due time Christ died for the ungodly.... 8 But God demonstrates His own love toward us, in that while we were still sinners, Christ died for us." (Rom 5:6, 8). Note that this above Scripture does not say that 'while we are still sinners' instead it says "while we were still sinners", it means that once we believed the Lord Jesus we have been made the righteousness of God (2 Cor 5:21). Now all we need to do when we fall in to sin is to remember how we were a sinner with no forgiveness but only condemnation before we were made righteous and then continue to walk in the power of the new nature of God (2 Peter 1:5-9; Col 3:10). Because we were made righteous children of God in Christ Jesus, we reign in this life through the unending forgiveness of our Father in Heaven and therefore have no condemnation for all our sins anymore for eternity ahead (Rom 5:17, 21; 8:9, 1). We are now righteous because God the Father has made us righteous. Praise the Lord! The following explanation of the "Parable of the Merciful Father" from Luke 15:11-32 is an excerpt from my Book, "Sit to be empowered, Walk to be blessed and Stand to possess – Part 1". In the parable of the Lost Son in Luke 15:11-32, the younger son wasted all his possessions that he received from his father by journeying in to the far country of the world. His life ended up in a mess, when He had nothing but a severe famine in the land. He was in constant need of food to survive. When he went and joined himself to a citizen of that far country, penniless and in tatters, he sent him in to his fields to feed swine. In his hunger to survive he longed to eat the pig’s food, but he was denied to eat even that pigs pods. Here we see that the Lost Son was actually operating in his sinful nature which longs to fulfill its own desire apart from God (Rom 7:17-21, 23-24). We too in the natural apart from God are like the lost son. Now and then we sin and lose the precious possession of joy, peace and righteousness of the Heavenly Father’s possession because of the fallen state of our sin-sick souls (John 14:1; Rom 14:17). Many times because of the influence of the fallen nature within us we do not even remember that we already have peace and rest which God has already given to us in Him [i.e. Christ’s nature within us]. We only need to choose to be of good cheer and celebrate what Christ has already done for us by overcoming the world system of governance that is purely influenced by this sin nature of Satan and his demonic cohorts (John 16:33). The Bible says that, “The sinful nature wants to do evil, which is just the opposite of what the Spirit wants. And the Spirit gives us desires that are the opposite of what the sinful nature desires. These two forces are constantly fighting each other, so you are not free to carry out your good intentions.” (Gal 5:17, NLT). In other words, what the Apostle Paul is expressing in this verse is this: We have this sinful nature of the Lost Son [i.e. old man (Eph 4:22)] within us constantly desiring to waste the heavenly possessions of our Heavenly Father with prodigal and wasteful living. But in the innermost part of our being where our spirit is, our Heavenly Father has deposited His Spirit’s nature within it which is called right mind man [i.e. new man (Eph 4:23-24)] with which we should renew ourselves constantly and live out the abundant life of our Heavenly Father on earth. The demonically influenced nature of our soul is constantly in direct opposition to the Holy Spirit influenced nature of our spirit. This is the reason we are not able to live freely and flawlessly with the right thinking perpetually, even though we are born again, tongue speaking, demon driving and Spirit filled believers. This parable which has usually been called as ‘the parable of the prodigal son’ is mostly seen in the context of a sinner coming at once to the Heavenly Father’s home of His kingdom to be born again. But the real meaning is really different because the man without Jesus who is not born again in to the family of God cannot be called as the son of the Heavenly Father at all (John 1:12; 3:3; 17:9). In this parable the far country is the world and its deceitfulness in which some believer’s are swayed in to like the lost son in this parable and become desperate and hungry for reality. The world hates these lost godly people who are searching for reality and meaning of this life, who are impoverished spiritually, downtrodden by despair and depression. So only Jesus hours before His death on the Cross prayed this most beautiful prayer to our Heavenly Father, “14 I have given them Your word; and the world has hated them because they are not of the world, just as I am not of the world. 15 I do not pray that You should take them out of the world, but that You should keep them from the evil one. 16 They are not of the world, just as I am not of the world. 17 Sanctify them by Your truth. Your word is truth. 18 As You sent Me into the world, I also have sent them into the world. 19 And for their sakes I sanctify Myself, that they also may be sanctified by the truth.” (John 17:14-19). This prayer shows that, as long as we live in the world it is the Father’s merciful nature that keeps us from the evil one who is Satan. We are sanctified and separated already in Christ Jesus who is our substitute, representing us individually before the Heavenly Father based on His perfect life, to shower God’s mercy constantly upon us. As long as we are in the world we are constantly sanctified by the truth of God’s word which renews our mind to remember the right things of God with the right mind. We are renewed and restored by the truth of what Jesus has done for us, which has also given us the rights to live as a part of God’s family as a son (Rom 8:16), and qualifies us to receive as much mercy and grace whenever we need from our Heavenly Father. But on our part we need to remember the merciful nature of our Heavenly Father like the Lost Son and approach boldly our Heavenly Father’s Throne in heaven to experience His goodness. This Lost Son by remembering his father’s unchanging merciful and benevolent character came to himself [i.e. his right mind] and said, “17…‘How many of my father’s hired servants have bread enough and to spare, and I perish with hunger! 18 I will arise and go to my father, and will say to him, “Father, I have sinned against heaven and before you, 19 and I am no longer worthy to be called your son. Make me like one of your hired servants.”’ 20 “And he arose and came to his father. But when he was still a great way off, his father saw him and had compassion, and ran and fell on his neck and kissed him. 21 And the son said to him, ‘Father, I have sinned against heaven and in your sight, and am no longer worthy to be called your son.’”” (Luke 15:17-21). In times of spiritual crisis when we have sinned and as a result feel unworthy and condemned, we should boldly approach the throne of grace to obtain mercy and find grace in time of our need like the Lost Son (Heb 4:16). The Lost Son felt unworthy with sin-consciousness to approach the father and told him that he not only sinned in his sight but is surely unworthy to be called his son. This clearly shows that the Lost Son approached the father for mercy, already knowing that the father by his omnipresence and omniscience knew what he had done and have seen all his sinful doing [Note: the words “I have sinned…in your sight”]. But see how the father compassionately responded to his Son’s need by running towards him even while he was only trying to approach the Father’s home in heaven (Matt 6:9). In the same way when we sin and feel unworthy about our self, and then we start to think of approaching God’s throne, even while we start to think of approaching our Heavenly Father when we are long way off from heaven down in this earth, our Father in heaven sees us and feels intensely compassionate, He runs and falls in to our neck and kisses us. Our Heavenly Father sent Jesus in to the world representing Himself, to show His mercy and compassion towards us his sons who are tempted constantly and fall in to sinful things (John 14:9; Heb 2:17-18). In other words, Jesus Christ as the replica of our Heavenly Father is representing the Heavenly Father to us and is compassionately giving out the Father’s mercy to us as we approach Him every time after we sin and seek God’s mercy (Heb 2:17-18). 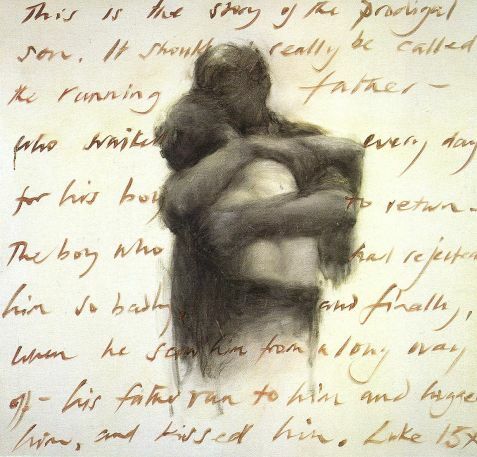 This ‘compassionate heart of the father in the preceding parable who ran toward his sinful son who wronged him, fell on his neck and kissed him’ represents the one act of the compassionate heart of the Heavenly Father in sending His only begotten Son to die for us on the Cross (John 3:16). The Lost Son rested in the merciful character of the father. As a result the father said, “It was right that we should make merry and be glad…” (Luke 15:32). And in these words Jesus has revealed of how in the sphere of redemption, our Heavenly Father’s heart rejoices every time we come to Him through Jesus Christ to receive His mercies. It is not the elder brother ceaseless toil that brought forth joy to the father’s heart, but the younger brother’s trust in the father’s merciful character that made the father do everything for him and celebrate it joyfully. When the prodigal son returned home, having wasted his material in uncontrolled living, the father did not rebuke for the waste that had been done, or even ask a word of inquiry regarding the wasted possession. He did not sorrow over all that was spent; he only rejoiced over the opportunity the son’s return afforded him for spending more. Why? Our Heavenly Father owns the whole universe and it is not at all a problem to give His mercy and grace to us who are His sons as many times as we need. God is so wealthy that His chief delight is to give. He is so very, very rich, it gives him true joy when we let Him give and give and give again to us. He longs that we will just let Him do and do and do, and it gives him immense satisfaction as we start to celebrate and rest in all His infinite possessions. If Jesus told Peter to forgive the brother who sins against him seven seventy times, how much more infinitely will our Heavenly Father forgive his sons who sin and come to Him again and again asking for His mercy and grace (Matt 18:21-22). Do you think that the moment you cease trying to please God, your good behavior will cease? Do you think that resting in the merciful character of our Heavenly Father to forgive and give and give will be less satisfactory to Him than if you do some of it yourself with your rigid rules? It is only as we try to do it ourselves that we will put ourselves under the law, which will disqualify us to become the recipient of God’s mercy and grace (Rom 4:4; 11:6). Our best works are dead works and is hateful to God because it is ineffectual (Gal 3:10; Heb 6:1). It is highly significant to see that both the sons were equally removed from the joys of their father’s house. But only the lost son because of believing in his father’s merciful and benevolent character to give was able to enter the rest and celebration of the father’s house. The younger son was all wrong, but he came home and he found rest, and this is where Christian life begins as the Bible says, “4 But God, who is rich in mercy, because of His great love with which He loved us… made us sit together in the heavenly places in Christ Jesus,” (Eph 2:4, 6). The elder son even though was near to his father, he was always working to please him by mechanically doing his father’s work as a duty. He never was able to find the real rest and celebration of his father’s house because he clung on to his own good works which he did with his own ability. In fact, when the older brother heard that his younger brother has returned home and that the father is arranging a great feast and celebration for all because he has returned safe and sound, he was very angry and upset with the father’s merciful character of giving. He had an evil eye which cannot see the beauty of the father’s grace (Matt 20:15). It cannot see the brightness of the Heavenly Father’s generosity. It cannot see the unexpected blessing to others as a precious treasure. It is an eye that is blind to what is truly beautiful and bright and precious in the sight of our Heavenly Father who first “…desires [to show] mercy and not [just receive] sacrifice. '…” (Matt 9:13) and then “…delights in [showing] mercy” (Micah 7:18). It is a worldly eye that hates seeing other’s receive undeserved favor of His grace. It sees money and material reward as more to be desired than a beautiful display of free, gracious, Father-like generosity. That is why the older son said to his father angrily and ironically, “29 …‘Lo, these many years I have been serving you; I never transgressed your commandment at any time; and yet you never gave me a young goat, that I might make merry with my friends. 30 But as soon as this son of yours came, who has devoured your livelihood with harlots, you killed the fatted calf for him.’” (Luke 15:29-30). As long as we live our life on this earth, if we try to please God through our works, we will never be able to experience the joy, peace, righteousness and rest of the Heavenly Father’s house in this earth like this older son. But if we will accept our inability and unworthiness to please the Father because of our indwelling sinful nature like the lost son and accept his forgiveness, mercy and grace by approaching the ‘throne of grace’ every time we fall down because of our sinful nature, we will be able to enter in to God’s celebration and rest that he freely gives to us. Those sons who try to work and please God will not only lose the experience of God’s joy of celebration and rest in this earth, but will also lose their reward in heaven for eternity. All the rewards would have actually belonged to them if they would have only believed, but because of their dead works of worthlessness to please God, all their works will be burnt by fire yet they themselves will be saved (1 Cor 3:11-15; 2Cor 5:10). Stop ‘giving’ your works to God and see what kind of giver God is (Ps 34:8). Stop ‘doing’ your works for God and see what kind of worker God is. Christianity starts with the celebration rest of coming in to God’s kingdom by receiving the Heavenly Father’s mercy. The moment we receive the Father’s mercy by believing Christ Jesus as our Lord and Savior (John 3:3), immediately the Heavenly Father will command His servants the angels (Ps 103:20) saying, “‘Bring out the best robe [of righteousness (Is 61:10)] and put it on him [whom? We who are His lost sons], and put a ring [of authority (Esther 8:2, 8, 10; Dan 6:17; Hag 2:23; Luke 10:19)] on his hand and sandals [of protection (Deut 29:5; Eph 6:15)] on his feet. 23 And bring the fatted calf here and kill it, and let us [i.e. God, angels and the whole of heaven (Luke 15:7, 10)] eat and be merry; 24 for this my son was dead [and separated from My mercy and love because of unbelief] and is alive again [through his faith in My merciful character to forgive and receive him]; he was lost [because of selfishness] and is found [because of my love for him].’ And they began to be merry.”(Luke 15:22-24). The moment we enter in to God’s kingdom from the Satan influenced worldly kingdom of darkness (Col 1:13; Rev 12:9; Matt 4:8-9; Eph 5:8; 6:12), we can choose to celebrate and celebrate for eternity and be merry all the time, this is the reason Apostle Paul said in Phil 4:4, “Rejoice in the Lord always. Again I will say, rejoice!” and also 1 Thess 5:16, 18, “16 Rejoice always…18 in everything give thanks; for this is the will of God in Christ Jesus for you.” Christianity starts with an invitation to enter the singing, music and dance celebration of God the Father, as Jesus Himself said in Matt 22:2-4 [The Message], “…"God's kingdom," … "is like a king who threw a wedding banquet for his son. He sent out servants to call in all the invited guests. …"He [then again] sent out …servants, instructing them to tell the guests, 'Look, everything is on the table, the prime rib is ready for carving. Come to the feast!' (Luke 15:25; Eph 5:17-20). The moment you have received Jesus Christ as your Lord and Savior, you have already started to gorge in the celebration feast of the Heavenly Father God that will continue for eternity. Christianity not only starts with restful celebration of the Heavenly Father’s merciful character, but it also continues with the celebration-rest of God’s heavenly joyfulness which only those who diligently believe will enter in and enjoy like the lost son. As we are all sinners who sin till we die because of our indwelling sin nature within us (1 John 1:8; 1 Tim 1:15), we constantly need our Savior Jesus Christ who is compassionate and merciful to progressively shower God’s mercy and grace in time of our need (Heb 4:14-16; 10:23; 1 John 1:9). Some of you may be feeling a little uncomfortable with the above statement that has been made here. Because in many Churches right from our Sunday school time we have been taught to behave rightly all the time and be holy in this world. We have been told that anything that we do apart from this shows that we are not saved or may lose our salvation. This is not the real gospel of grace. This is work based religion. Think about it, Jesus said, “...I'm telling you that anyone who is so much as angry with a brother or sister is guilty of murder. Carelessly call a brother 'idiot!' and you just might find yourself hauled into court. Thoughtlessly yell 'stupid!' at a sister and you are on the brink of hellfire." (Matt 5:22, The Message) and "...anyone who even looks at a woman with lust has already committed adultery with her in his heart." (Matt5:28, NLT). According to this standard that Jesus had set for our works to be perfect before God, one wrong thought or one wrong word is enough to throw us away eternally in to hell fire by God’s perfect judgment. Along this line of thought Apostle James wrote that if a person keeps all the law but fails in one, he is guilty of breaking all (James 2:10). In other words no one is qualified enough to be called as righteous man before God based on their own works. The Bible also confirms this fact by saying, “For there is not a just man on earth who does good and does not sin.” (Eccl 7:20). According to this preceding verse, a man may be a believer or an unbeliever but he sins as long as he dies. Many believers do not like to accept this fact of inconvenient truth because it make them think that they may be seen in a bad light by others or even some people fear that they might miss heaven because of such imperfection. Others fear that accepting such thing will make them to sin fearlessly and still others fear that God will be grieved when we say that we sin until we die in some way or the other. Still some others want to adhere to their own strict rule book which will say some sins as knowing sins and other sins as unknowing sins. God’s set standard for qualification based on works is absolute righteousness. In other words, if a person wants to boast himself as a righteous person he must live absolutely sinless all his life, even if he commits a single sin once in his whole life he will be declared wicked by God and deserves to go only to hell. Such is the absolute perfection of God’s nature of justice. Does God require such perfection from us who do nothing but ungodly things all the time with evil nature acting constantly in us to destroy our very existence in this earth (Rom 7:14-15; 3:10-20; 1 Peter 2:11)? But the truth of God is just the opposite. If God wanted us to perform ourselves and self-justify ourselves by our own works, he would have sent a motivational speaker to motivate us to perform better works than before and not a Savior to save us from hell fire (Rom 5:6-8). But take heart, Apostle John identified our inability to please God all the time because of our indwelling sin nature (Rom 7:19) and said, “My little children, these things I write to you, so that you may not sin. And if anyone sins, we have an Advocate with the Father, Jesus Christ the righteous.” (1 John 2:1). Now and then we sin and try to justify ourselves saying this is just a small sin or else comparing ourselves with others we say, ‘I am not sinning like that brother or sister who is overtaken by trespasses (Gal 6:1).’ When a person reaches the highest point of such self-righteousness, they start to think that God is indebted to them because they have worked so hard to please Him. Some people when they see a person who does not have any special spiritual qualification get equally and tremendously even more blessed than themselves, they become angry against God which is absolutely wrong and a bad attitude (Matt 20:1-16). These people, who try to earn their blessing, forget that God is the greatest giver who cannot help himself but give. So only, as the Bible says God gives his blessing of rain and sun rise every day [i.e. physical and financial blessing] on the good and on the evil person, on the just and on the unjust person without partiality (Matt 5:45). This is the true benevolent and merciful character of our heavenly Father (Matt 5:48). Religious attitude always makes our eyes to get blurred of the real image of our Heavenly Father. We don’t do God a favor, by being involved in any spiritual activities. All the prayer that we make, the Scriptures that we read day by day and meditate, the right choices that we make does not make God better as though God is in need of our constant attention and love, it makes us better and successful to fulfill the best custom designed destiny which God has prepared for us because He is love (Joshua 1:8-9; Jer 29:11; 1 John 4:8). Even we love God because he has already loved us through His only begotten Son Jesus. We are not the initiators, we just are receiver’s who give out what we have already received (1 John 4:9-10). We are not the illuminating source, but we are just reflectors of God’s love (1 John 4:7-8, 11). Anyone who thinks that he deserves to be blessed is already blind to see the spiritual reality of heaven. A spiritually blind man cannot approach the throne of grace to receive mercy and grace in time of his need when demonic condemnation and fear hits him right on his head, because of his spiritual blindness he will not be able to locate the exact place of God’s throne in his innermost being of his spirit-man to connect to God. He needs God to heal his blindness before he can see the throne of grace to receive mercy and grace. He needs a supernatural miracle to be cured from this spiritual blindness caused by religious spirit. All these different types of bad attitudes and thoughts that we have seen above are self-justifying demonic thoughts of Satan which will keep us from receiving God’s mercy and grace like the older son who was very judgmental, prejudiced and biased in the parable of the lost son (Luke 15:25-32). If we allow such attitude to influence us knowingly or unknowingly, God will see us as a proud person whose only desire is to please our own self, in our own way, with our own strength rather than God. Such pride will be resisted by God Himself (James 4:6). God only justifies those who come to him humbly seeking to receive His mercy and grace (James 4:6-10; 1 Peter 5:5). [Note: Even though grace and mercy looks the same, it is different. Mercy is something that God does not give us what we rightfully deserve. Ex: hell, death, torment. Grace is something that God gives us what we do not deserve. Ex: heaven, joy, righteousness, earthly blessings.] Only as we know our unworthiness as sinners to receive God’s grace, only then we will be able to align ourselves humbly before God’s ‘throne of grace’ as His son with God’s holy boldness to receive as much grace as we need (Heb 4:16; 10:19). Right alignment positions us to receive the right quantity of God’s resources, thereby making us believe His merciful unchanging character of mercy which will make God to impute us with His abundant gift of grace which reigns through righteousness to eternal life through Jesus Christ our Lord, as a saint of the Most High God (Rom 5:17; 4:5-8; Eph 1:1; Rom 5:21). When you are distressed, learn to rest in God’s mercies by throwing yourself in to the hands of God like David, who was declared as the man after God’s own heart by God Himself because of this unique revelation of God’s mercy that he applied in His daily life (2 Sam 24:14; Acts 13:22; Ps 90:14; 94:18; 100:5; 109:21, 26). May God help us all to trust in the mercies of our Father in Heaven and draw near to him always in our sinful state (Heb 4:16; 10:22-23). May our Heavenly Father's forgiveness make us have a holy awe, passionate seeking and a respectful fear of the Lord in the recesses of our heart. May God help us all to rise up above our weakness and reign powerfully through the grace of our LORD JESUS and the everlasting love of our Heavenly Father's forgiveness through the spiritual communion of the Lord Holy Spirit (2 Cor 13:14). Amen and Amen!! Praise the Lord, for HIS MERCIES CONTINUES FOREVER!! !